Having already been relegated to the far corners of the bed I solidified my position after purchasing the highly sought after snoogle. Kitty was at a friend’s house enjoying a day at the pool, so along with a few other things I decided to do a little something extra. After a long… long day of battling traffic, long lines, and armies of pregnant moms jockeying for position in the isles of the baby depot, I finally found and purchased the snoogle. The snoogle was quickly embraced and Kitty has found plenty of time to enjoy her new gift. We went to the second ultrasound today. Our long wait at the doctor’s office was rewarded when we saw our baby once again. It moved around a bit and then the doctor showed us its little fingers and toes. 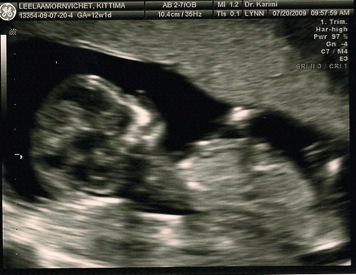 A little bit later the doctor gave us the news….. It’s a boy! Since week six Kitty has been experiencing increasing morning sickness. She has been very tired and apparently has developed a supernatural sense of smell. This didn’t bode well for my chana masala which was promptly banned from our dinner menu. I can only hope that my Chipotle burrito bowl will be spared. I have also become well acquainted with our dishwasher and laundry room.